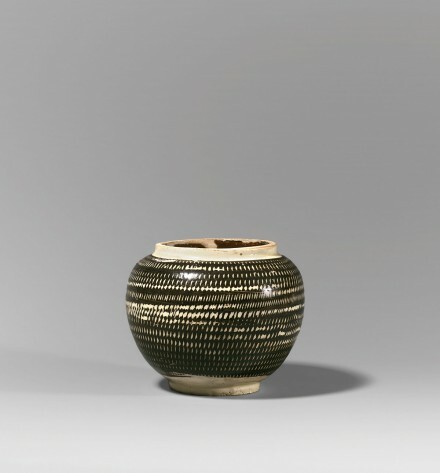 of spherical form, covered with a dark olive-brown slip layered over a cream-white underslip and cut with a sharp-toothed roulette tool to show short strokes of white in loosely arranged horizontal rows, the short neck and broad ring foot in plain white and the interior glazed olive-brown, with a glossy transparent glaze all over. A similar jar is illustrated by Ayers, The Baur Collection: Chinese Ceramics, Vol. I, Geneva, 1968, no. A76, and the same jar is illustrated by Tregear, Song Ceramics, London, 1982, p. 95, no. 96, and another similar jar is illustrated by Krahl, Chinese Ceramics from the Meiyintang Collection, Volume One, London, 1994, p. 265, no. 486. Other examples are in the Illustrated Catalogues of Tokyo National Museum: Chinese Ceramics I, Tokyo, 1988, p. 141, no. 564; in Mayuyama, Seventy Years, Vol. 1, Tokyo, 1976, no. 574, now in the Umezawa Gallery; in the catalogue of The Raymond A. Bidwell Collection of Chinese Bronzes and Ceramics, Springfield, 1965, p. 72 left; and in Black Porcelain from the Mr. and Mrs. Yeung Wing Tak Collection, Guangzhou, 1997, pp. 94-95, no. 45, described as Baofeng ware from Henan province.